Discussion in 'Online Games - News and Reviews' started by Kotsy, Apr 26, 2013. 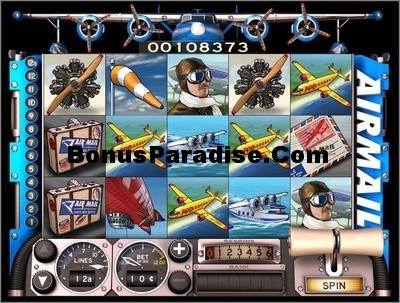 Airmail is an Online Video slot with a Progressive Jackpot and has a great re-spin feature where you can have a chance to create winning combinations. In order to be eligible to hit the Progressive Jackpot, the minimum bet is 20.00 per spin. The Progressive Jackpot is hit when you receive 5 Zeppelins (blimp) in a winning line. Jackpot amount is displayed at the top of your screen. All wins pay left to right. Scatter symbols to activate the re-spin feature can appear anywhere on the screen. Receive 3 or more Scatter symbols and start the re-spin feature. You have the option to use the re-spin, or collect your winnings. You have a total of 6 re-spins available. You hold one of the reels to create a winning combination. The cost of the re-spin will be displayed above the reel. What a fantastic Video Slot from Slotland Casino. Play Airmail today, and fly away with winnings.